APRIL is the month when we celebrate EASTER. On APRIL 4 we will have a whole day of RECONCILIATION for the whole parish. Practically the fathers will be available for confession during the whole day. – EDGE, the youth program for those preparing for Confirmation will be organized on FRIDAY, APRIL 5. – ALPHA JUNIOR – Friday April 12, at 6:30pm in Zanon Hall. – On APRIL 6 we will have a Lenten Retreat for the Italian Community and at the same time the FIRST REUNION of the MARRIAGE RENEWAL WEEKEND. – THE PARISH MISSION will be on Monday, Tuesday and Wednesday, APRIL 8 – 9 -10 after the 7:00pm mass with Fr. Ben St. Croix. ALL INVITED. THE CATHOLIC MOMS GROUP will meet on the third Tuesday of every month at 10:00am and 8:00pm (In April it will be on April 16). THE CELEBRATIONS OF THE HOLY WEEK. PALM SUNDAY with the blessing and procession of the Palms will follow the regular Sunday schedule. HOLY THURSDAY – April 18 – 8:00pm – Mass of the Last Supper in English and in the Main Hall in Spanish. 9:15pm HOLY HOUR in English – 10:00pm – HOLY HOUR in Spanish – Church Doors will be closed at midnight. GOOD FRIDAY – April 19 – 12:00 noon – Stations of the Cross in Spanish. 3:00pm – The Lord’s Passion (English) – 5:00pm – Stations of the Cross (English) – 6:30pm – The Lord’s Passion (English) – The Lord’s Passion (Spanish in Main Hall) – 8:00pm – Stations of the Cross (Italian). HOLY SATURDAY – April 20 – EASTER VIGIL – all together – At this celebration we will welcome into the faith more that 20 Adults, who have participated in the RCIA preparation. EASTER SUNDAY – April 21 – Regular Sunday Schedule. THE FIRST COMMUNIONS will be celebrated: APRIL 27: at 11:00am Fr. Zanon School and at 3:00pm Mary Fix School. MAY 4: at 11:00 St. Timothy & Atrium Schools and at 3:00pm St. Catherine and Public Schools. CONFIRMATIONS: May 14 Fr. Zanon & Mary Fix; May 15 St. Catherine, Public Schools and Spanish; May 16 St. Timothy & Atrium. All Celebrations will take place in the Church t 7:00pm with Holy Mass; Archbishop Robert Rivas, OP will be the celebrant giving the Confirmation. EDGE – March: 1 – 15 – April 5 – May 3 – 17 – June 7 – 21. PARISH FEAST with Procession of the Blessed Sacrament in the streets of the Neighborhood – JUNE 23, 2019 with HIGH MASS at 1:00pm followed by the Procession. 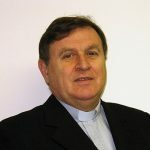 Father Walter Tonelotto was born in Italy in 1947 and entered the Scalabrini Seminary at an early age. At 20 he was sent by his superiors to study Theology at St. Joseph’s Seminary in Dunwoodie, New York and then to the Toronto School of Theology. He holds a Master in Divinity from St. Paul’s University in Ottawa and a Master in Moral Theology from Union Theological Seminary at Columbia University, New York City.